If you're looking for a handset with more bling than the iPhone then consider Vertu's latest creation. 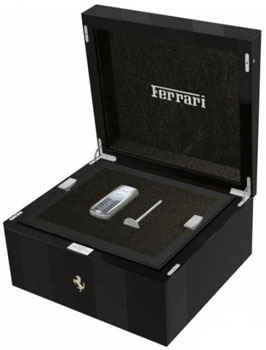 Its ultra-exclusive Ascent Ferrari 60 phone costs €18,000 (£12,600/$25,530) and has been designed to celebrate the sportscar company's 60th anniversary. Vertu's Ferrari 60: worth the price? 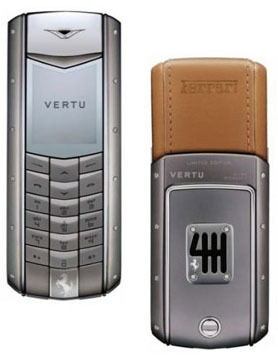 The back of the handset is partly decked in brown leather, embossed with Ferrari's logo, and a titanium panel featuring a gear-box pattern. Various Vertu and Ferrari logos are also dotted about the handset, because what's the point in spending that amount of money on a phone nobody notices? The screws used to hold the phone together have the same head as thouse used to hold Ferrari's cars together and, for being such a good customer, Vertu will also throw in some Ferrari ringtones and wallpapers too. Vertu doesn't mention the handset's technical specifications in much detail, but it did tell us the phone gives four hours' talk time and is tri-band GSM. It also includes Bluetooth and has "precision engineered" keys to help users, we assume, dial their butlers more accurately.